This gift guide has been a highly requested one and I totally get it - guys are the most difficult to shop for! I pulled together a few ideas that I think most guys would really enjoy. Of course, keep the person you are shopping for in mind and tailor your gift to their individual interests and personality. Some of these gift ideas may be a fun way to surprise them with something they wouldn't have thought to ask for, but will totally love. Makita Drill Kit - This is a great gift for a 20 something guy or anyone on your list who might not have a quality power tool. Stephen got this for Christmas when we first moved into our house a few years ago and it has been so great have on hand. It has some serious power behind it! Apple Watch - This is such a great gift for anyone. I thought I'd be the last person to want an Apple Watch, but Stephen surprised me with one last Christmas and I'm still obsessed. 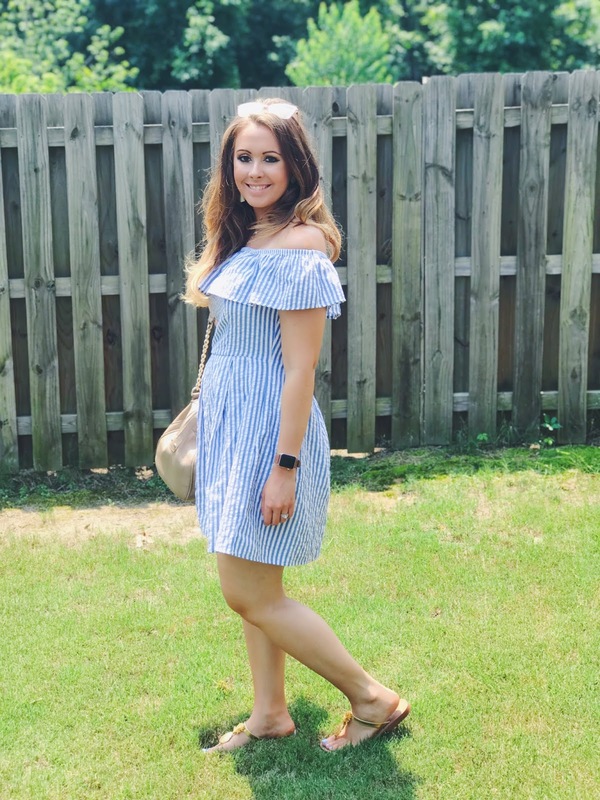 He has had one since they came out and loves all of its capabilities - fitness tracking, calling/texting, Siri voice command, controlling all of our smart home devices (more on that in a bit), navigation, Apple music, and so much more! It truly does everything. *You can buy one of the older series if you're looking to spend less. Air Pods - Keeping with the Apple theme, if your guy has an Apple Watch already, these are the perfect accessory. They're wireless ear buds that charge in a tiny little case that can slip right into your pocket. They pair to your watch or phone and make working out at the gym or going on a run so convenient. Sony Wireless Noise Cancelling Headphones - These are another great option for headphones. Some prefer over the ear headphones for premium sound quality and comfort. I would recommend these for someone who travels a lot, as they will be comfy for long period of time and the noise cancelling feature is awesome on a plane or somewhere with lots of background noise. There is also an app where you can adjust sound (pitch, bass, venue - outdoor stage, concert hall, etc). They come with a sturdy and compact case as well! Waffle Maker - If the guy in your life loves to cook (or at least loves to eat food), kitchen gadgets make great gifts. Whether its a waffle maker, breakfast sandwich maker, or panini press, find the perfect kitchen gadget that they wouldn't buy for themselves but would totally love! Oakley sunglasses - Nice sunglasses are always a great gift! I love that Oakley is sporty, modern, and classic all at the same time. They make a wide array of regular sunglasses and sports glasses, so you're bound to find the perfect style for any guy on your list. Sunglasses are something they'll wear almost every day, so you know they will get tons of use out of them. Cozy slippers - I mean, who doesn't love a cozy pair of slippers? These ones come in a few color options and look so warm. I like that they have the rubber bottoms so they can be worn walking down the driveway as well as inside. Burberry Touch cologne - Cologne is always great gift. It's something most guys love to spritz on, but not necessarily something they will go out and purchase themselves as a top priority. If you're not sure where to start, this is a great scent that is classic, manly, and not at all overpowering. Trust me, it is so good! Reversible Pullover- This pullover is made of great quality, soft material and its reversible! It comes in lots of colors and you're basically getting 2 for the price of 1! I've gifted this before and it's been a hit. Phillips Hue Smart Light Bulbs - Okay, so I could write a whole post on smart home devices thanks to my high tech husband. If you have no idea what smart home means or if you think the options are overwhelming, this is the perfect place to start! These lightbulbs last 20 + years and are controlled by an app on your phone. You can change the color of the light to any color you want, set "scenes" for certain events, coordinate with what you're watching on tv, make them "move" to the beat of music, and use Siri voice control to tell them when to turn on and off, to dim them, etc. You don't need an iPhone to use them, but it is extra nice if you do have one. We have 4 lamps in our house that have the bulbs, plus we recently put one in the light fixture over the bathtub. Talk about relaxing! 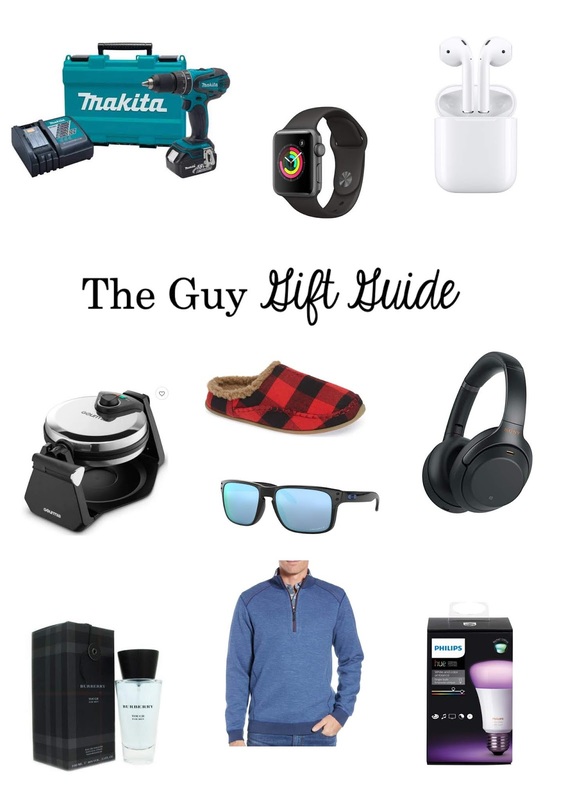 I hope this gift guide gave you some ideas to help make shopping for the men in your life a little easier! Stay on the look out for more gift guides coming soon!